Screen shot of the game Stalactites from Pretty Good Solitaire. 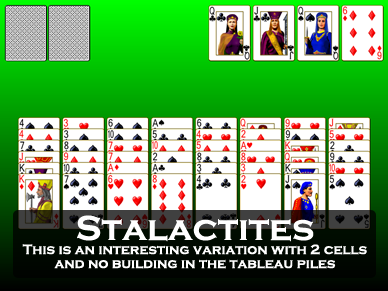 Stalactites is a variation of FreeCell. 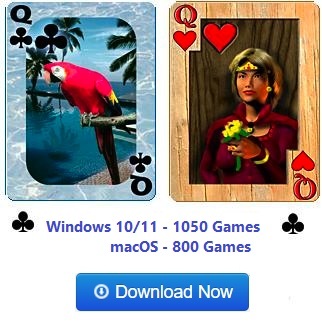 It is a somewhat unusual FreeCell type game. Four cards are dealt to four foundation piles, then the remainder of the cards are dealt face up to eight tableau piles. It is an open game (all cards face up at the start). There are also two cells, which begin the game empty. The four foundation piles are built up regardless of suit from the first card dealt, wrapping King to Ace as necessary, until each pile contains 13 cards. The game is won when all of the cards are moved to these foundation piles. There is no building in the tableau. The only moves you can make are to the foundation piles, or to move a card to a cell to get at the card below it. Once a card has been moved to a cell, the only place it can be played from there is to a foundation. 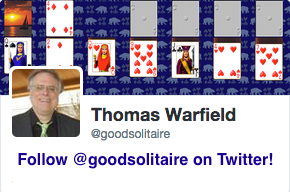 This means you need to be very careful what cards you move to a cell. You want to be able to move it quickly to a foundation to open up the cell again, since there are only two cells. 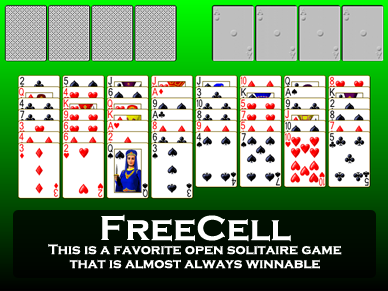 Unlike most FreeCell type games, it is very difficult to win Stalactites every time. An average player wins only about 30% of the time. Much better percentages are possible, but you may get blocked in some games.